This special custom ring is full of symbolic meaning and was made in memory of our customer's late mother. The number of diamonds represent the numbers in her mother's birthday, and the year of birth is embossed in Roman Numerals. As her mother was born deaf, the sign language symbol for 'I love you' is also embossed on the outside of the band. 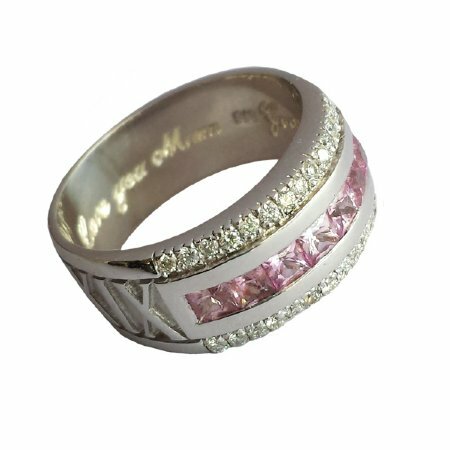 And the sapphires represent her mother's favourite colour - pink. It's a very precious piece!